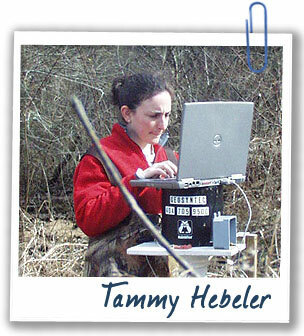 Tammy Hebeler applies her expertise in civil engineering to soils to predict how soils will behave under changing conditions. Did soil feature prominently in your childhood? Actually, it’s funny that you ask that question. I grew up in a military family, and we moved around quite a bit. When we moved from Oklahoma to Virginia, I took an old film canister, filled it up with soil, and took it with me. What sorts of projects have you worked on? Soil is the foundation of everything, so we try to figure out how it behaves. If you look at land conditions in big cities, the land may be valuable, but the soil may be bad for building. We come up with ways to make the soil better for urban construction. As an engineer working with soils, there are a lot of unknowns. You never know what’s below the ground. Storm waters are also a big topic now, so we go to construction sites and make sure they don’t have soil sediment release issues. If you hadn’t become an engineer what might have you done instead? I often wonder that on the bad days at work! I’ve always tended toward the sciences. Maybe something medical, definitely something science related.